Pink Lemonade: Another NO STAMPING project!!! LOL See I have all sorts of projects that I just haven't shared yet! LOL I bet you never knew I could create WITHOUT INK!!! Hahahaha!!! Well the story with THREE is that A Scrapbook Store here in Summerville had their Grand Opening on the 18th of August and I noticed that they didn't have table top garbage cans. 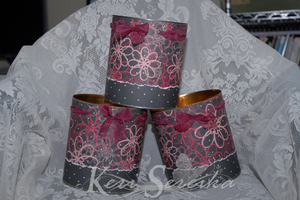 I quickly purchased some super cool Luxe papers that matched the hip pink and black decor of the store and made these as a "store warming gift" for Elise the store's owner. 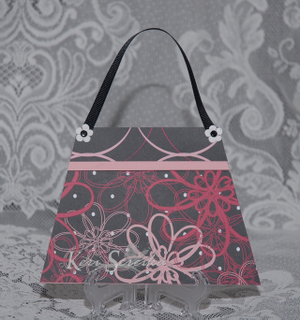 Then with the left over paper I whipped up the cute purse card to match! :) enjoy!